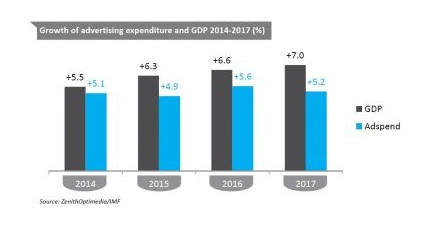 According to a recent report called new Advertising Expenditure Forecasts generated by ZenithOptimedia , there will be a growth of 4.9% in the global ad spend that will reach US$545 billion in 2015. 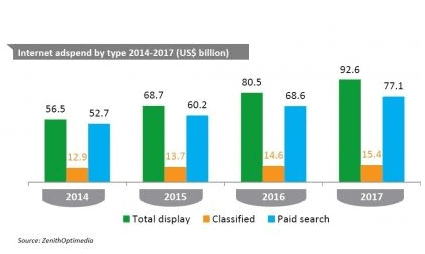 The report also revealed that there will be a 6% growth in the global advertising market a year over the next three years and the main components driving this growth as per the study will be mobile, social media and the transition to programmatic buying of digital display. As per the report, the growth will be 5.6% in 2016 and 5.2% in 2017. The main factors impacting the figures however will be the momentous events like U.S. Presidential elections, the UEFA European Football Championship and the Summer Olympics. “Mobile technology is creating new opportunities for brands to build relationships with consumers, while programmatic buying is making brand communication cheaper and more effective,” said Steve King, ZenithOptimedia’s CEO, Worldwide. Talking about the digital display, it’s doing amazing on mobile social media. Growth in traditional digital display has increased from 14% in 2012 to 18% in 2013, and 26% in 2014, which is its fastest rate of growth since 2007. In fact, the move to programmatic has bestowed traditional display a great boost. 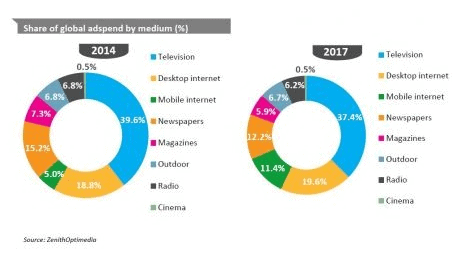 Although, till now there is a steady growth in TV’s market share of global ad spend, from 29.9% in 1980 to 39.6% in 2014, but as per the report it will fall to 37.4% in 2017. However, talking about the online video’s share of global ad spend, it is expected to increase significantly from 1.9% in 2014 to 2.8% in 2017.